New binding challenge completed with this jelly roll quilt! I’ve had some jelly roll fabric for a little while now and have been wanting to make a quilt with it, but just didn’t have time. Finally I’ve had a chance to put it together! I haven’t made my own quilt binding before so I went a bit out of my comfort zone on this quilt and rather than folding the back fabric round to the front for the binding, I opted to make my own binding out of scrap fabrics. I’m so glad I took the plunge to try something different as it was no where near as scary to do as I thought it would be and its worked out so much better than I thought it would, I will definitely be doing it again on my next quilt. The fabric I used was a jelly roll by The Craft Cotton company in vintage floral purple, which I cut down into different length strips, making sure I had 3 strips of the same length so they could be sewn together in threes before sewing all of these sets of threes together to make the quilt. The backing fabric was from IKEA. For the binding I used scraps leftover from the jelly roll and scraps I had left from a cotton fat quarter bundle in purple by Fabric Editions. 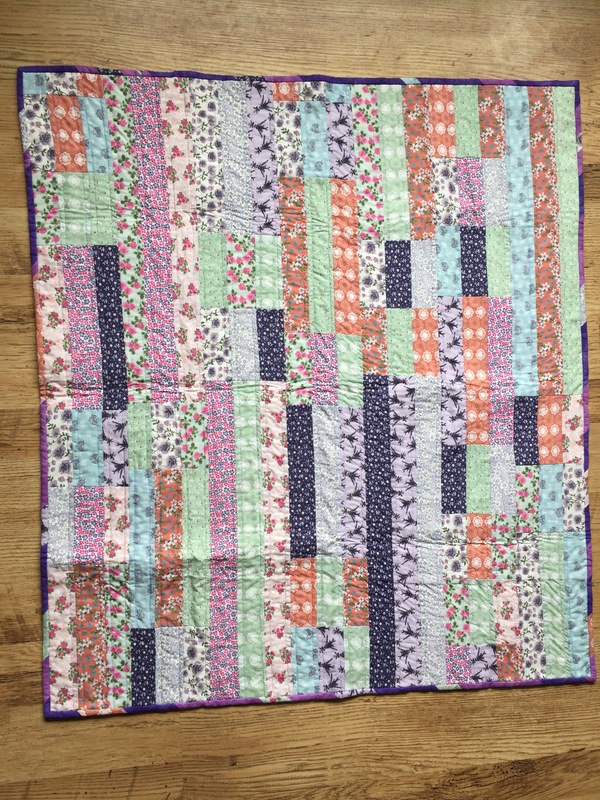 Super pleased with this quilt, what’s even better is this one is actually for me, I’ve been so busy making them for other people I’ve not got round to doing one for myself for a long time! < A huge help for pattern cutting and made only with fabric scraps, these pattern weights are a must have that I wish I had made sooner!